Three International Space Station (ISS ) crew members have returned to Earth after more than six months of performing scientific research and working to demonstrate new technologies in low Earth orbit (LEO). According to NASA, their landing went “by the book”. With Expedition 43’s mission now complete, the station is being prepared for new flights of the Soyuz, Progress, and Dragon spacecraft to the orbiting laboratory. The Soyuz TMA-15M spacecraft that carried Expedition 43 Commander Terry Virts (NASA) and flight engineers Samantha Cristoforetti of the European Space Agency (ESA ) and Anton Shkaplerov (Roscosmos) undocked from the space station at 6:20 a.m. EDT on Thursday, June 11, and landed in Kazakhstan at approximately 9:44 a.m. EDT (7:44 p.m. Kazakh time). The lead up to today’s landing was fairly routine. 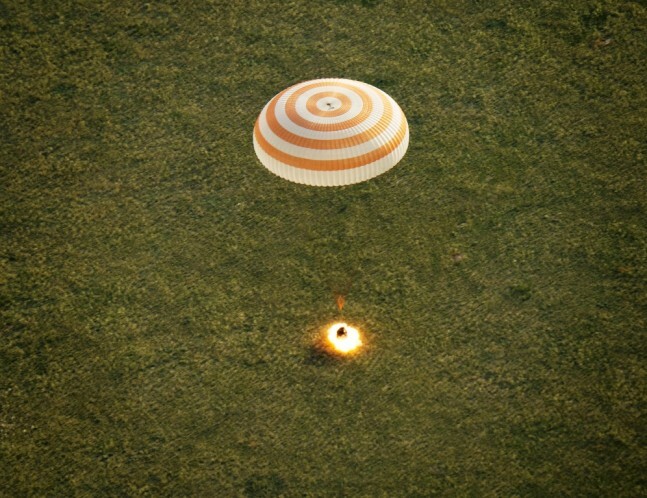 Once the Soyuz had undocked, a short burn was carried out to move the spacecraft a safe distance away from the station. At about 8:51 a.m. EDT, a deorbit burn was conducted to begin the landing process, it lasted for about four minutes and 35 seconds. At an altitude of about 87 miles, module separation occurred at 9:18 a.m, with the descent module and its precious cargo detaching and orienting itself for re-entry. Atmospheric re-entry occurred two minutes later at a distance of some 62 miles above the Earth. 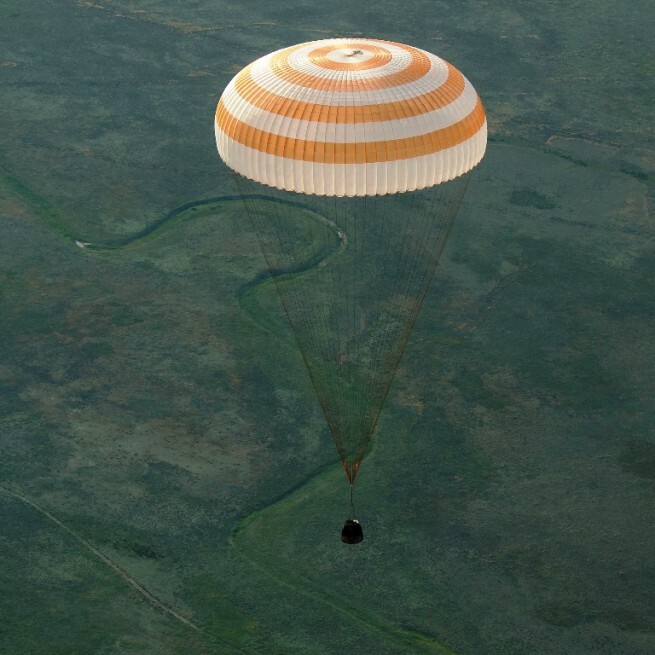 The order to deploy the parachutes, which would slow the rate of descent, was given at 9:23 a.m. EDT, just 6.2 miles above the steppes of Kazakhstan. In the last few seconds of flight, retrorockets were fired, followed by landing. The crew’s return was greeted by mostly clear skies and temperatures in the mid 80s. After they were back on the ground, the trio were placed in comfortable chairs inside an inflatable tent and given a medical review. The three space flyers will now part company with Shkaplerov traveling to Karaganda with Virts and Cristoforetti flying to Houston, Texas. 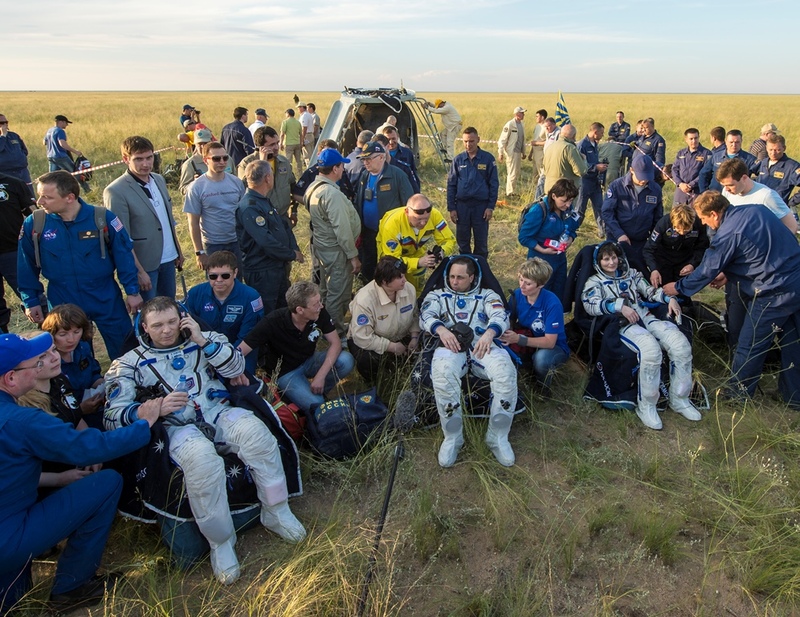 The trio had spent some 199 days in space, during which they had traveled more than 84 million miles since they launched from the Baikonur Cosmodrome in Kazakhstan on November 24, 2014. Everything did not go perfectly during this mission. 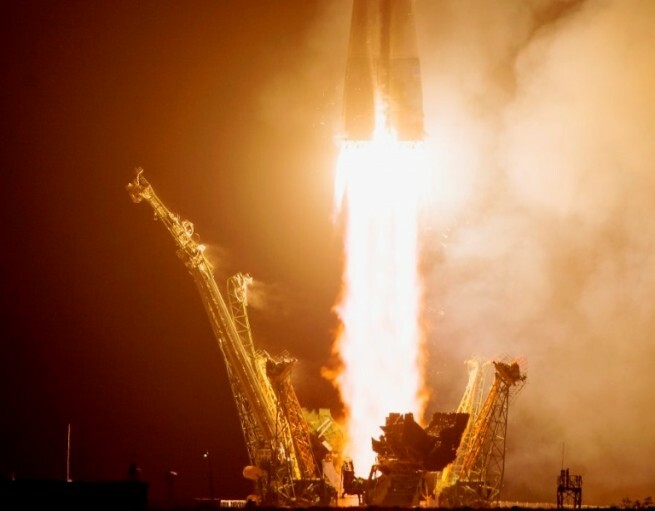 The return of Expedition 43 was delayed by four weeks so that Roscosmos could investigate the loss of the automated Progress M-27M cargo vessel that was launched on April 28. The issue caused the Expedition 43 to spend some extra time on orbit, which NASA’s Rob Navias referred to as a “bonus month”. 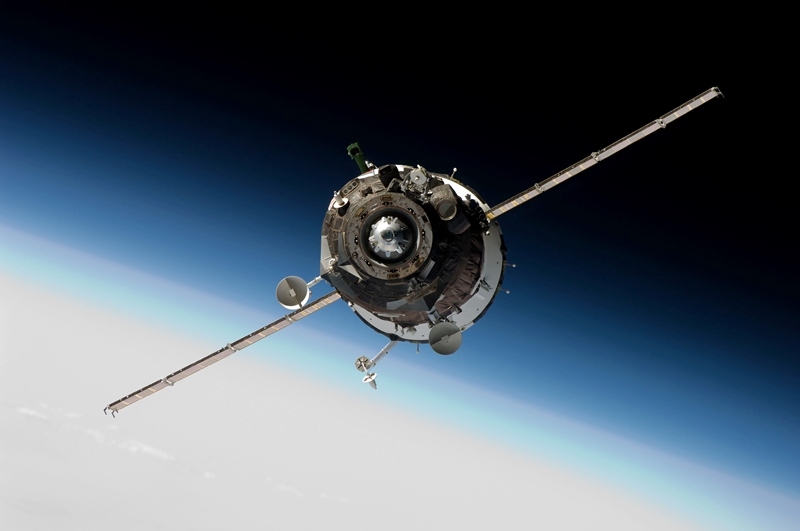 On June 1, Roscosmos stated that the Progress spacecraft had been damaged at the time of separation from the upper stage of its Soyuz 2-1a launch vehicle due to a design flaw in the separation system. The drama did not end with the Progress 59’s fiery re-entry into Earth’s atmosphere, however. While the members of Expedition 43 prepared for their trip home, Space Station flight controllers were tracking a fragment of a spent Minotaur rocket body launched in 2013. 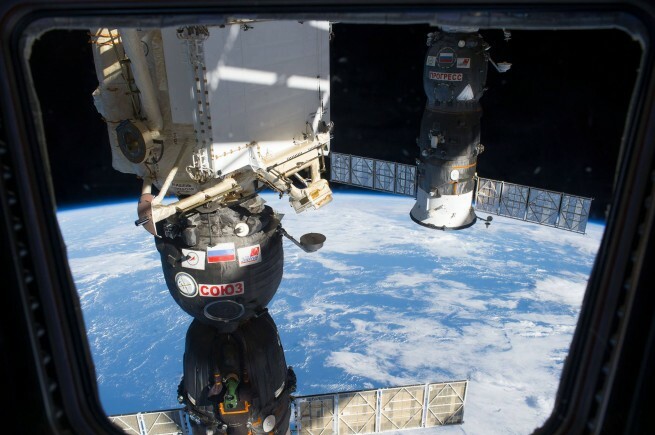 On Monday, June 8, at 2:58 p.m. CDT, those controllers executed a five minute, 22 second firing of the ISS Progress thrusters to raise the station’s orbit slightly, so as to distance it from the debris which was projected to pass within 3 statute miles of the ISS later in the day. The members of Expedition 43 continued to train for their descent through Earth’s atmosphere and tested the thrusters of their Soyuz TMA-15M spacecraft during this time. On Wednesday, June 10, a brief change of command ceremony was held with Virts handing the station over to his successor, cosmonaut Gennady Padalka. Expedition 44 formally began this morning with the undocking of the departing Soyuz. With the conclusion of Expedition 43, Virts has logged 212 days in space on two flights, the first was on space shuttle mission STS-130 on board the orbiter Endeavour in 2010. Shkaplerov has spent 364 days on two flights, the first of which was on Expedition 29/30 in 2011. Despite the fact that this was Christoforetti’s first flight, she now holds the record for the longest spaceflight by a woman, a record previously held by NASA astronaut Sunita Williams. Padalka and crewmates Scott Kelly of NASA and Mikhail Kornienko of Roscosmos will operate the station until the arrival of NASA astronaut Kjell Lindgren, Russian cosmonaut Oleg Kononenko, and Kimiya Yui of the Japan Aerospace Exploration Agency (JAXA ), who are scheduled to launch from Kazakhstan in July. Kelly and Kornienko are on a one year mission aboard the ISS, twice the duration of a typical mission, in order to provide researchers with more data about medical and psychological challenges faced by astronauts during long duration spaceflights. Roscosmos, the Russian Federal Space Agency, is planning on launching members of the Expedition 44/45 crew aboard a Soyuz spacecraft/booster combo sometime between July 23 and 25. This is not the sole launch that Roscosmos has on its revised manifest, according to NASA: A Soyuz taxi flight that will bring up Flight Engineer Sergey Volkov and return Commander Gennady Padalka is scheduled for launch Sept. 1. Volkov will be accompanied by European astronaut Andreas Mogensen and a third crew member yet to be announced. The Expedition 46/47 trio will launch Dec. 15. In terms of sending cargo to the ISS, Russia appears eager to get back in the game after the failed flight of Progress M-27M. The craft and its 5,196 lb (2,357 kg) of cargo and crew supplies was lost, eventually burning up in Earth’s atmosphere on May 8. Roscosmos is hoping to carry out three Progress flights, with the first launching on July 3 and the two following missions slated to take place on Sept. 21 and Nov. 21. If everything goes according to plan, these flights will follow the June 26 launch of a SpaceX Falcon 9 v1.1 rocket with its payload of the Dragon spacecraft. The privately-produced vessel had been scheduled to take place earlier this month. However, with the loss of Progress M-27M, NASA opted to slightly delay the mission so as to restock the cargo on Dragon. Seems that Soyuz will be the only way to and from ISS for years to come, so this nominal touchdown is truly welcome news. How those Republican members of Congress can dare criticize Russia for any future problems with ISS crew access and yet refuse to fully fund alternative U.S. systems is all the more reprehensible.